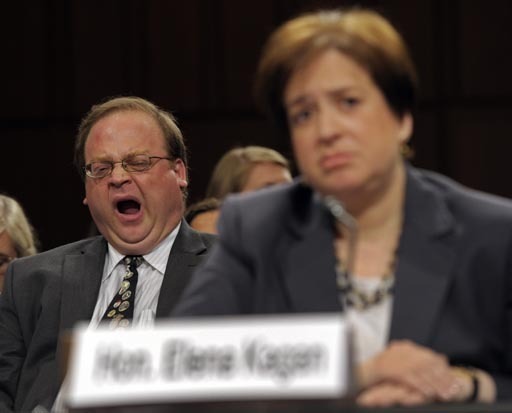 Well, another Supreme Court confirmation hearing has come and gone, and the all-but-certain-future-Justice Elena Kagan admirably proved the point she made back in 1995 when she wrote that the hearings had become "a vapid and hollow charade." Just as John Roberts, Samuel Alito, and Sonia Sotomayor had done, Solicitor General Kagan assured the senators that, no, of course her political preferences would not dare show their faces when she sat on the Supreme Court. Just as their predecessors had done, the majority of members on the Judiciary Committee demonstrated that without staff-prepared papers in front of them, their capacity to explore the nuances of Constitutional law more or less equaled their capacity to perform microsurgery. Blindfolded. To be fair, there were a couple more promising lines of inquiry at the hearing. But they were cut short by the now-customary refusal of a nominee to say anything that might throw light on her approach to the work of a Justice. South Carolina Republican Sen. Lindsey Graham, one of the few committee members who brings intellectual light to these proceedings, said what most everyone knows but will not admit: Of course you will bring your values to the bench, just as the Justices on the conservative side of the divide do. He asked exactly the right kind of question when he said that since nobody likes "activist" judges, could you please name one Justice, present or past, whom you regard as an "activist?" General Kagan declined the opportunity. Another Republican, Oklahoma's Tom Coburn, asked what was, hands down, the most provocative question of the entire proceeding when he said: Suppose I sponsor a bill requiring every American to eat three fruits and three vegetables per day, and the Congress passes it and the President signs it. Does the "Commerce Cause" of the Constitution permit the government to exercise that kind of power? Coburn was really trying to elicit from Kagan a hint of how she might rule on what conservatives derisively call "Obamacare," which requires Americans to have health insurance (or pay a penalty). Could Congress force citizens to purchase a product or service? The real value of his question, intended or not, was to expose the vacuity of the whole "activist!" label. The attack on judicial activism has for decades focused on the allegedly improper judicial reach into areas that should be left to the political process. Courts, the criticism goes, have substituted their judgment for the judgments of elected officials. Even silly laws, the critics say, cannot be struck down just because judges think they are dumb. This criticism stemmed manly, though not exclusively, from the political right. Yet in recent years, conservatives have cheered on the Court when it struck down laws - even when it overturned longstanding precedents and at times seemed to reach a decision far broader than the case demanded. Thus, this Court found that the Second Amendment's right "to keep and bear Arms" was not only an individual right, but one that restrained state and local governments. In the "Citizens United" case, it found that corporations have essentially the same First Amendment rights as individuals - and issued that ruing in a case that could have been decided on far narrower grounds. The point here is not that these decisions were wrong, but that they flowed from a Court that was more than willing to reach broad decisions overruling the judgment of the political branches of government. Which brings us back to Senator Coburn's "fruits and vegetables" law. A witness as nimble and brilliant as Kagan should have had field day with that question. Remember, Coburn's premise was that the Congress passed this law and the president signed it. Why? Had obesity and diabetes grown so prevalent that they were threatening America's competitiveness because its workforce was so ill? Were heath care costs spiraling out of control? And if that were so, was there some concept of "liberty" -- the same one that protects the use of birth control or a woman's right to control her pregnancy -- that forbids the government from telling people what to eat? Well, here's my version of this: Ask a nominee whether she likes Major League baseball's "designated hitter" rule. We might learn whether she would let the American and National Leagues have different rules -- a clear sign of federalist state's rights thinking -- or whether she prefers one rule for both, suggesting sympathy for widespread federal regulation. Think it's a dumb idea? Go look at the tapes of the hearings we just sat through. Jeff Greenfield is CBS News' senior political correspondent. You can read more of his posts in Hotsheet here.